Stabilizers Jacks YES 6 NOS. 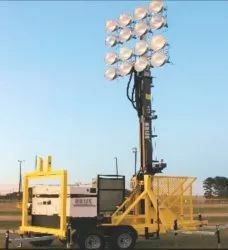 A mobile floodlight package equipped with a diesel water cooled engine attached to a 20kva diesel genset to supply power to operate 10-1000w Metal Halide floodlights position on a 50ft electric 120v telescoping tower assembled on a four wheel towable trailer. This complete package will be able to illuminate between 10 to 40 acres and project a beam to illuminate a target area 2000ft from the light source. 20kva Diesel Engine Water Cooled, 40/35hp at 1800/3000rpm. Equipped with engine safety shutdowns. Operates for 24 hours. Generator is rated 25kva,20kw, 208Y/120v, 3ph with AVR regulation. Floodlights: 10 -1000w Metal Halide, Nema 3/2 reflectors. Tower design 50ft electric winch double cable 120 volt Worm Gear. Proprietory safety features on Telescoping Boom and Floodlighting System.